Around these parts, we like to rag on bikes by saying "two wheels bad." But for police officers, motorcycles are an invaluable law enforcement tool because they can go places cars can't — and they can get there much more quickly. Also, there's just something obscenely cool about being a motorcycle cop. Taking a bike on patrol makes you easily 10 times more awesome than other cops. But how do you make a police motorcycle even cooler? You add a sidecar, that's how. 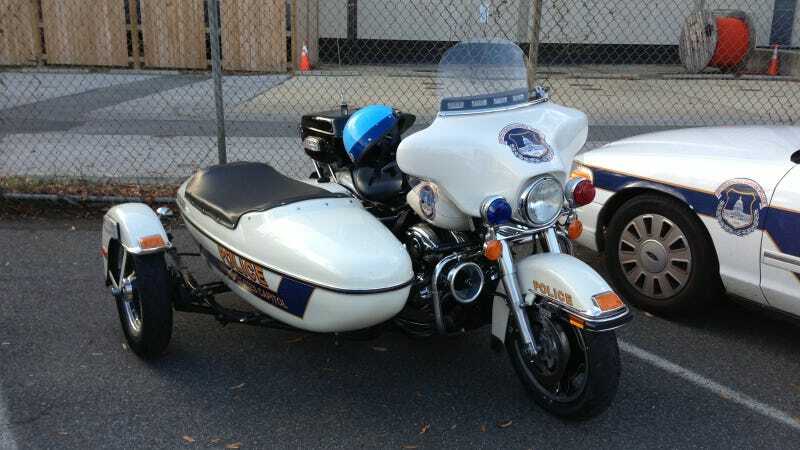 After I moved to Washington, D.C., I was kind of surprised to learn that during the winter months, the police up here mount sidecars onto their patrol motorcycles. I had never really hard of modern-day police using them. When we think of sidecars, we tend to think of really old military bikes or Batman's motorcycle from the 1960s TV show. Every year, shortly after Columbus Day, sidecars are hooked up to the department's big bikes. The sidecars stay on until spring. With a third wheel, the motorcycle can stay upright in icy or snowy conditions or when roads are covered with wet leaves. That's the main reason it's there, anyway. The Post says that other officers occasionally ride in the sidecars, and sometimes kids ride in them at parades. But not dogs, sadly. Rider Magazine last year published a pretty fascinating history of the motorcycle sidecar. They had their heyday in the first half of the 20th century until they were mostly made obsolete by — get this — cars. With the advent of cheaper automobiles, nobody wanted to ride around in a sidecar, except for fun. They also said that in the U.S., only three motorcycle manufacturers sell sidecar rigs anymore: Harley-Davidson, Ural and Royal Enfield. I reached out to Harley-Davidson's media folks to ask about how many police departments in the U.S. ask for sidecars, but I never heard back. The cops in D.C. aren't the only ones. Police in Pittsburgh, another city known for tough winters, also apparently use sidecars on their bikes during the winter months. At least neither of them put suspects in a cage-like sidecar like the Los Angeles police apparently did in the 1920s. Wait, that's actually amazing. Why did we stop doing that?